I’m going to start by talking a little about myself as a practitioner. I love people, I love their individuality and the similarities that can be found within humanity. That’s why everything I do is for the human experience. I use my work to inspire, to stimulate emotion and to celebrate individuality and interaction. My medium being embroidery, print and illustration. Another big part of who I am is community engagement and social action. Reaching out to people in need and caring for the fellow human. Doing what I can to make my community a better place to live. That’s why this residency is such a perfect fit, it is an opportunity to combine community engagement with my textiles practice in a way that could make a difference to real people and refugee communities. I remember leaving the first meeting brimming with ideas, after being informed of the scope of the Thread Bearing Witness project and how I could fit into that amazing narrative during my residency. 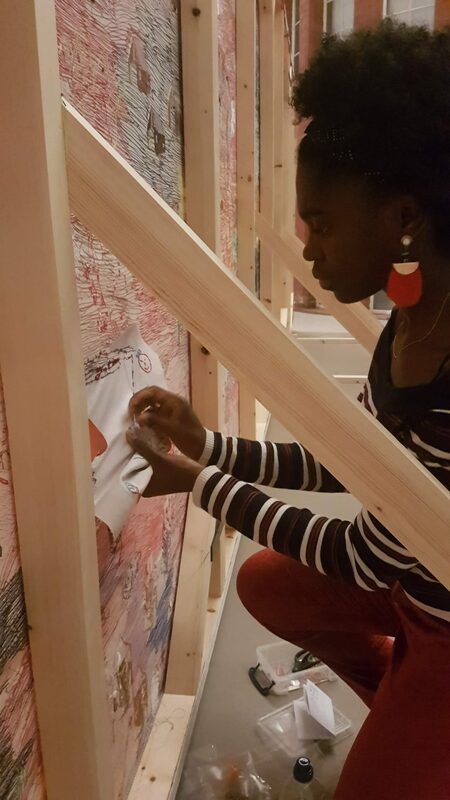 I had the privilege of assisting with the install of the Thread Bearing Witness exhibition, this was my first time seeing this process. I was immediately blown away by the detail, effort and man power that went behind installing this exhibition. Seeing the curator working with Alice to see how to best fit her vision for the exhibition into the space. How the different elements would communicate with each other and the viewers. 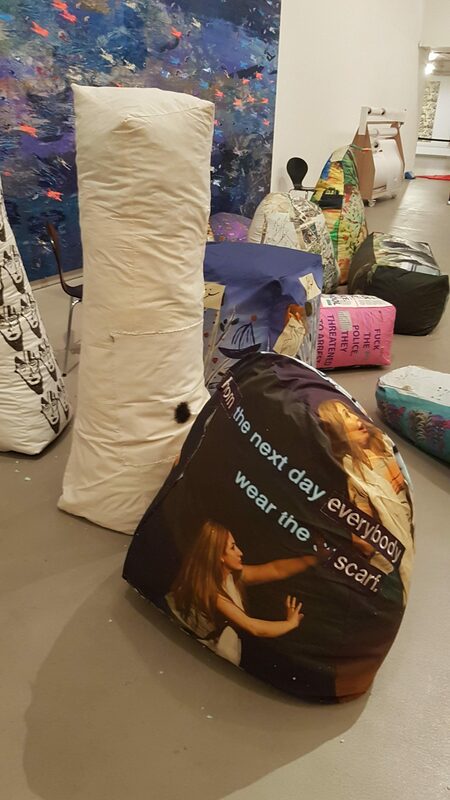 It was during this time I got to meet The Travelling Heritage Bureau of Displace Women Artists who made the pillow sculptures that made part of the exhibition. This was so inspiring. I sat alongside the women helping to fill these massive pillows and I was able to get into some good conversations with some of them. One conversation that stuck with me is when I asked the meaning behind a pillow which was covered with photography of what seemed to be a performance. The maker told me the pillow was showing her performance piece which was inspired by the mandatory hijab ruling in Iran and how her mother was one of the many women who protested this ruling and how the artist grew up in a world where the mandatory hijab was normal. She also spoke about how women were not allowed to dance or sing alone in public, so in her performance piece she danced, as a kind of ode to the freedom she now has here in the UK. It’s encounters like this that have really opened my eyes to the drastic change the migrant community have to go through when transitioning into life in this country. 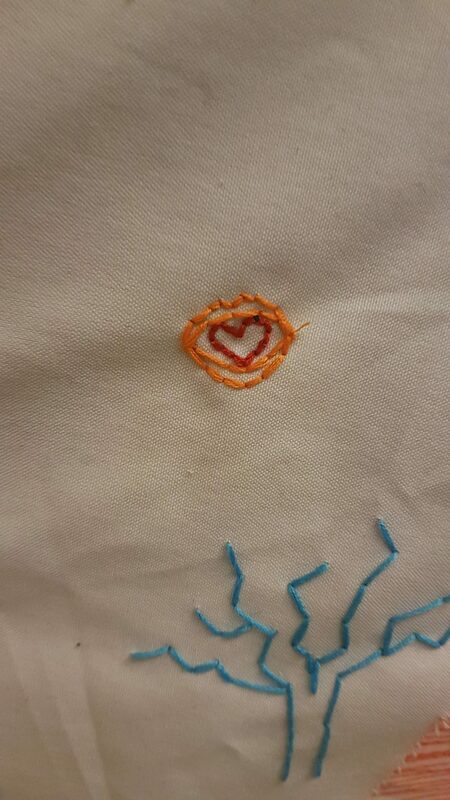 After meeting with Alice and hearing and reading about the heart behind the Thread Bearing Witness exhibition, I’ve started to learn what it means to be an ethical practitioner in this modern age. And that it’s possible to both master your craft, be a voice of change and make a positive impact in community. This has fueled my passion for my creative career to be ethical at every point. You don’t have to wait till you have a big company or loads of money, you can make small moves with what you have. 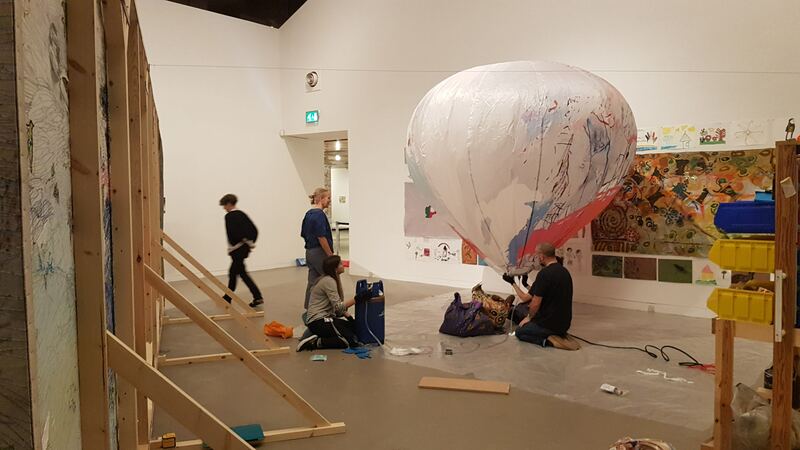 For example, I will be hosting art workshops for refugee groups with the Whitworth, with the simple intention of building confidence and giving dignity to individuals, whilst also building healthy relationships between the refugee and migrant community, and The Whitworth Art Gallery. I hope I will have more opportunities to make lasting positive change using my textiles practice.